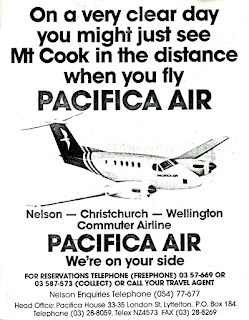 Both SPANZ and Mount Cook Airlines had services that connected Christchurch and Alexandra, though both operators included other stops; SPANZ stopped at Oamaru and Timaru while Mount Cook's flights were via Queenstown and Mount Cook. Goldfields Air was the first airline to introduce a direct service and the next airline to operate to Alexandra also tried this route. This is Pacifica Air 's story. 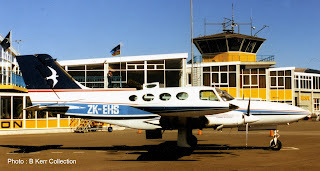 In early December 1986 Skeggs Food Limited applied to the Air Services Licensing Authority to conduct a Category "B" air transport service between Nelson and Wellington, and Nelson and Christchurch using a 12-seater Beechcraft Super King Air aircraft. The man behind the airline, Cliff Skeggs, was at that time the Mayor of Dunedin, and owner of Skeggs Foods and Pacifica Shipping and he hoped to improve Nelson’s air service.After the collapse of Air Albatross Nelson was left with a single daily Friendship flight to Christchurch in the middle of the day and with Coast Air operating twice daily on the route with an 8-seat Piper Navajo. Like Air Albatross, it had over extended itself with its Twin Otter and had downsized to the Navajo. With the announcement of the Pacifica service Coast Air’s chief executive, Phil Heaphy, announced that Coast Air would continue servicing Nelson until Pacifica got started before concentrating on its Greymouth-Christchurch services. Competition was also found on the Cook Strait flights to Wellington in the form of Air Nelson. 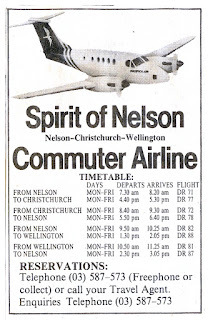 The Beech, which was to be called the Spirit of Nelson, was to offer two flights a day between Nelson to Christchurch and two flights a day between Nelson and Wellington. But Cliff Skeggs was cautious noting that the public had lost confidence with the Air Albatross collapse. The airline intended leasing its aircraft to test the market. He also noted that the new airline, like Pacifica Shipping, would be run by a very small team. 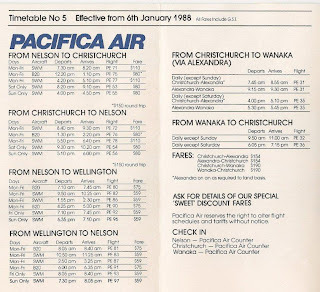 The airline had hoped to commence operations on the 23rd of March 1987 but in the event the aircraft did not arrive in New Zealand until the 28th of April. 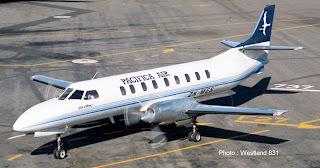 Services began on the 11th of May 1987 when the newly registered Beech 200 Super King Air, ZK-CGS (c/n BB-301), began Pacifica Air’s operation. The company initially planned to operate for a three month trial period and initial responses were encouraging, particularly on the Nelson-Christchurch sector. 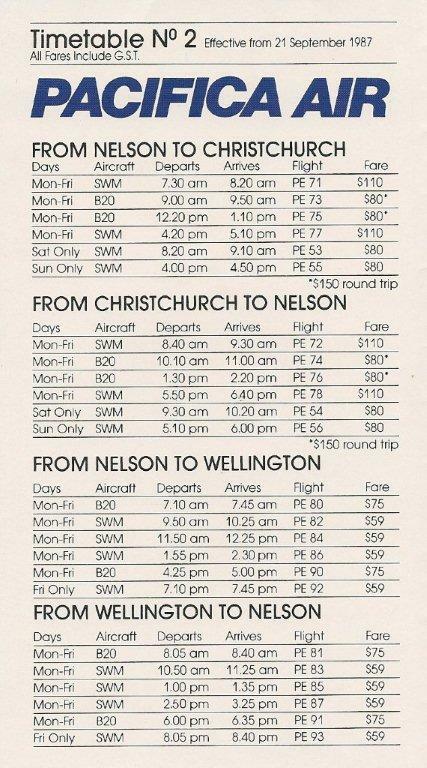 The Nelson-Wellington flights, which were not so convenient for business traffic, had not attracted the same level of patronage. The day after arrival on Beech Super King Air ZK-CGS, taken at Christchurch on 29 April 1987. The increase in patronage was encouraging enough, however, that a second aircraft was added to the fleet in the form of a Swearingen SA226TC Metroliner II, ZK-MES (c/n TC-231), the Spirit of Nelson II, which entered service on the 21st of September 1987. The additional aircraft meant that the airline could offer a more extensive timetable, including peak hour flights to Wellington. Swearingen Metroliner II, ZK-MES at Christchurch on 9 September 1987. What do you think??? Was Mount Cook Airlines move predatory? 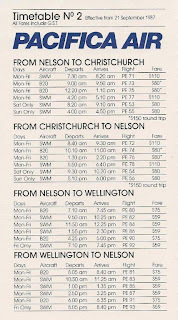 Their timetable with the existing Air New Zealand service shown below. The competition was not the only turbulence Pacifica Air had to weather. In early December the Beech was struck by lightning and was out of action for nearly two weeks while awaiting a power control unit which had to be sent to Australia for repairs. While the Beech was out of service, the Metroliner had an inflight engine shut down. Unfortunately, the fault necessitated an engine replacement which had to come from the United States leaving the airline without an operational aircraft for some days. 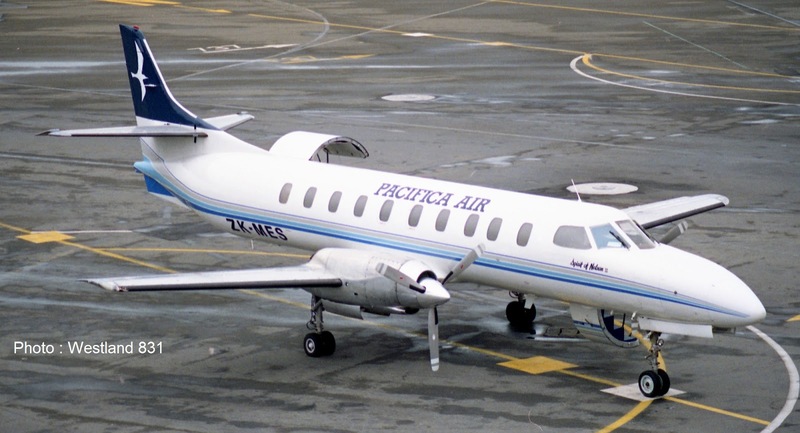 Chartered aircraft were used to move passengers and by the 6th of January 1988 both Pacifica Air’s turboprops were back in the air. 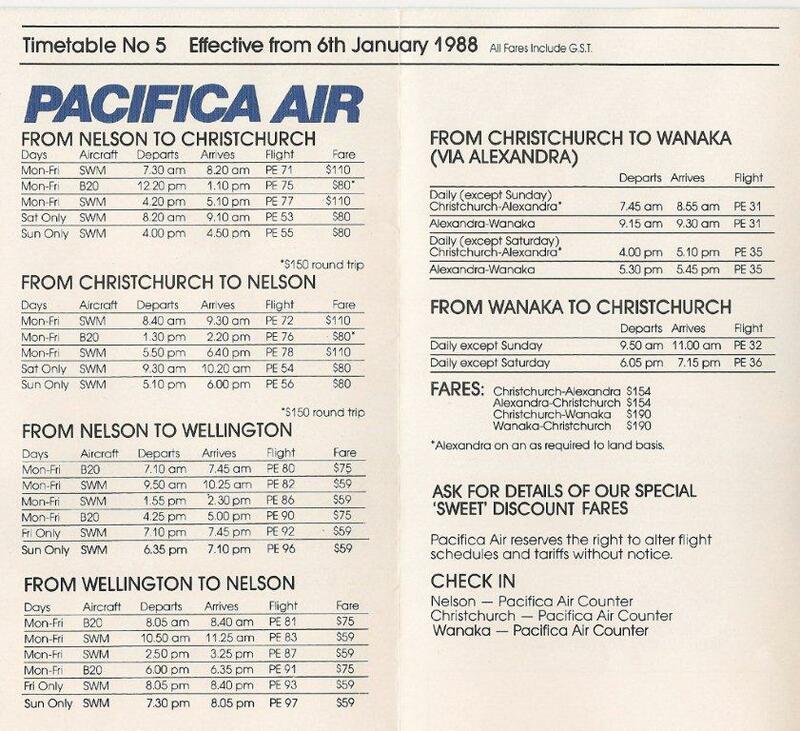 Also on the 6th of January 1988 the airline started a new route from Christchurch to Alexandra and Wanaka. The first flight was operated by the Metroliner but normally a nine-seat Piper Pa31-350 Navajo Chieftain, ZK-FOP (c/n 31-7405227) was used. Marketed as the Edgewater Express the service was designed to fly guests to Wanaka’s Edgewater Resort hotel as well as other holidaymakers and visitors. Once again the new air service was operated on a three month trial with two flights being operated on weekdays and with a single flight on Saturdays and Sundays. At the time the Central Otago air service started Pacifica Air formalised their connection with Ansett New Zealand. Another shot of Swearingen Metroliner II, ZK-MES at Christchurch on 26 April 1987. Piper Pa31-350 Navajo Chieftain, ZK-FOP, at Christchurch on 28 February 1988. Early in the new year a Cessna 402B, ZK-EHS Utililiner (c/n 402B-0217), was leased and operated out of Nelson replacing the more expensive Beech King Air. Cracks were starting to appear and in the end Mount Cook Airlines competition and new Airways Corporation charges proved too much. Cessna 402B Utililiner ZK-EHS taken at Nelson in April 1988 with the Pacifica Air flag to the left of the aircraft. 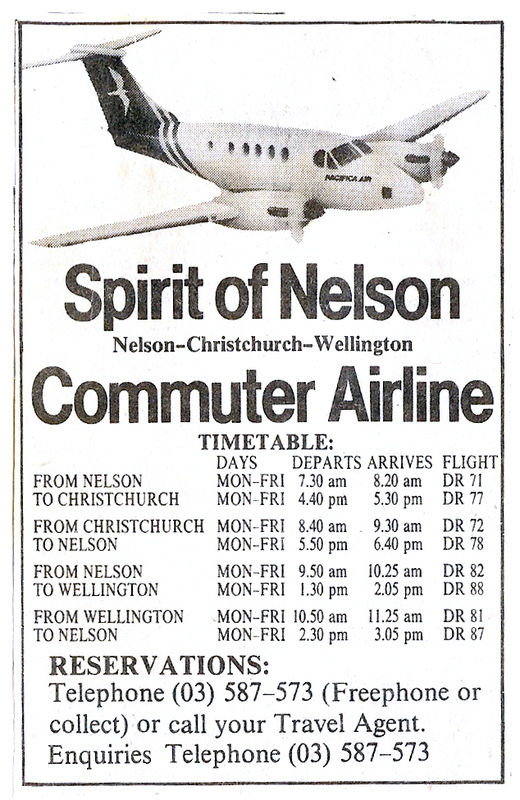 Initially, cutbacks were made to flights between Nelson and Wellington, and then, a week later, the announcement that the company would withdraw entirely from Nelson on the 7th of June 1988. Pacifica Air was philosophical about the move. 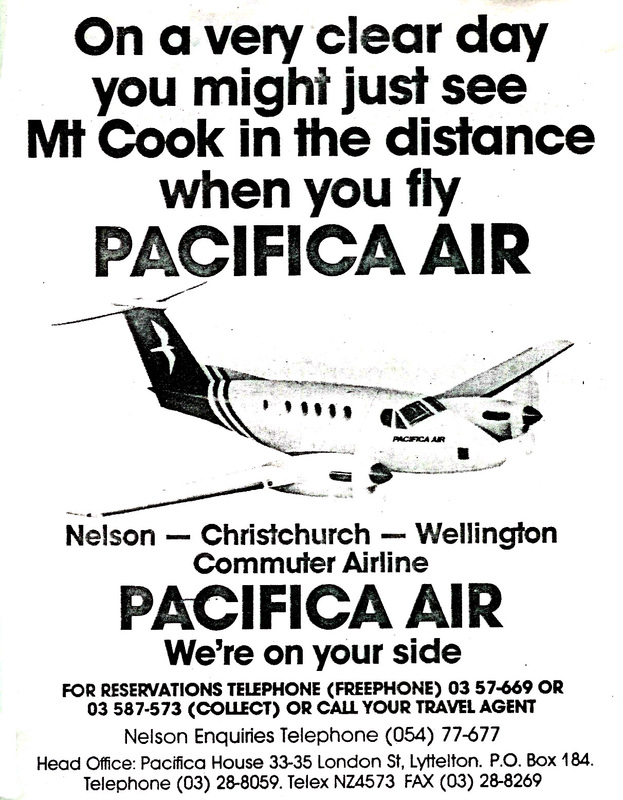 The company’s general manager, Rod Grout, expressed regret about having to withdraw from Nelson to the Nelson Evening Mail but, he noted, “We believe that Mount Cook Airline and Air New Zealand have recognised the need to provide cheap, regular services to the Nelson community that they should continue to operate at the current levels. Should they fail to do so, Pacifica would have to evaluate the possibility of reintroducing its service." With the Metroliner out of work Air Nelson looked at leasing it for a one period as it took over Air New Zealand’s West Coast services and some Nelson-Christchurch and Nelson-Wellington services. However the lease did not eventuate and eventually the aircraft was exported. "The Edgewater Express" being flown by Piper Chieftain ZK-FQW departing Alexandra on 1 December 1988. The Christchurch-Central Otago route continued to operate using Piper Pa31-350 Navajo Chieftains ZK-FOP and ZK-FQW (c/n 31-7952206). The company also used Piper Pa23-250 Aztec ZK-DHB (c/n 27-3735) on this service. 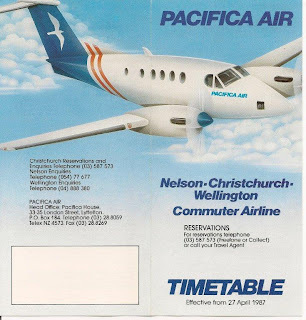 This service too, however, was not sustainable and on the 27th of February 1989 Pacifica Air ceased scheduled operations and ending its Christchurch-Alexandra-Wanaka service. As a postscript a third Piper Pa31-350 Chieftain ZK-CGS (c/n 31-7852068) was registered to the company but this was not used by them on a schedule. Piper Pa23-250 Aztec ZK-DHB at Christchurch on 24 February 1988.